After 3 months of waiting, efforts, and spendings…The painting is done. Have a 1st look at this amazing painting. This is a picture of Buddha sitting on a lotus. His hand is holding a bowl that normally use as a container for foods. There are colorful fruits that served as food in this picture while the white elephant tooths symbolized the knowledge. 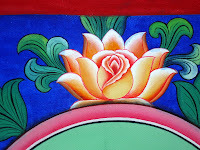 The 3 flowers above the picture symbolized the 3 wisdoms of human. 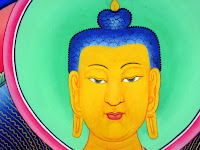 The Halo behind Buddha is always to be red in outer ring and purple in inner ring. Buddhists believes it is the light of the Savior and auspicious light that can only be seem when conditions are fulfilled. However, scientists has discovered the myths of this phenomena and given full explanation and what are the conditions to see the halo. More information. 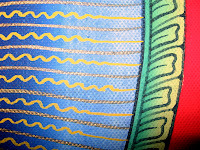 This 40×34 inches hand-painted painting is draw by a Nepal artist with postal color and water-based gold finish. 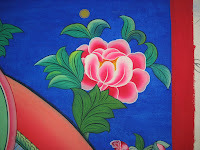 He is a very talented artist specialist in various Buddha painting in Nepal. However, being a artist in Nepal is a very tough job. With the control of the government and impact of the foreigners, those drawing that he earn from selling it far from covering their living and material costs. The Artist of this painting is Ram. It is a shame that I don’t know his full name and do not have a chance to take a picture of him. I met him while I was a production planner in where he is working now, I discovered his talent when there is a time I saw him a brought a small painting as a gift to his friend. That is the time I was thinking to invest a bit to test on him, and the result a quite satisfying. 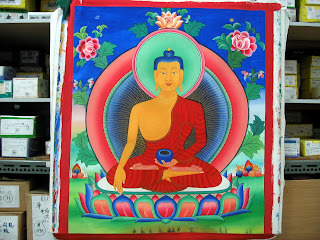 I bought him this 40″ x 40″ canvas and postal colors, together with the colors and tools brought from Nepal, he started this painting. He spent 2 weeks to accomplish the most important part of the painting-the head. 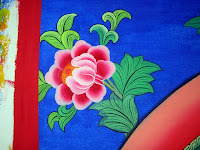 The emotion of the Buddha is fully reflected in this part, the hair is also very detailed as you can see. He told he that not to forget about Buddha hands and nails too, it has a beautiful lines on it. With the limited colors, bad quality of water, and polluted environment, he managed to draw this. This wisdom flowers is one of the favorite parts of mine. It is colorful, detailed, and emotional to me. He sacrificed much for this drawing, Everyday after 8 hours of labor works and 2 hours OT, he hardly left any energy spend on the painting. During weekdays, he told me that he has to avoid from many distraction and disturbance from his roommates (10persons in a room) like watching TV and hanging out. For me, I spent quite a number on the materials, and mostly time and petrol. Every time I travel to get him somethings, I have to travel 80kms to meet him. Overall I think I traveled 600kms…Also, we paid him for painting. Then you started to ask me: Why would you do this and mentioning this? My answer is simple: It’s a win win situation. I promised to sell this painting to public and I will continuous invest on him, get him better tools and conditions to do what he is good at, not just a labor. Second, with the extra money he earned for example, he acquired a hand phone recently that mean much to him as he can call his family in Nepal. Most importantly, he deserves better as a artist. Meanwhile, I also earn extra income if this painting is sold with good price. Although you may say that I’m not sincere enough to help a person, I think that this is just a better way to help each others. How can I continue to help him if there’s no money for me to reinvest? After all, I’m not a rich person.